It’s our final day at Fluorspar and we begin as usual with rounds. Two mothers are in the pediatric ward with their children. Luckily both children seem to be stable and the clinic staff recommended a treatment strategy approved by Dr. Michael. They have decided to withhold antibiotics as both cases appear to be viral and not bacterial. Dr. Michael views this as progress as he has been trying to educate the staff on not over prescribing antibiotics so as not to promote antibiotic resistance. The mother of one of the sick children. We also saw another woman we’ve been following. She remained in the clinic for the last two nights. She came to the clinic with a chronic cough that began one year ago. She is HIV+ and Dr. Michael thought the cough was due to an infection she acquired due to her being off of her meds. We had her CD4 count done again and in fact it is quite low, which means her HIV condition is under control. She has stabilized and been put on oral antibiotics. For now, she is sent home but will come back for follow-up and will be tracked via the Complex Case Care program. Dr. Michael advising staff on the treatment strategy for the woman who is HIV positive. A chicken walks in and out of your hospital room. Dr. Michael demonstrates one final neo-natal exam in the perfectly healthy baby boy. We then had our wrap-up meeting. Everyone gave a summary of their experience and observations of the week. It was all really positive and full of insights on what our next steps will be. We have accomplished quite a bit but we have so far to go. The good news is we are enjoying the process and I think in our small way making a difference with these two clinics. And as I told the group, my overall sentiment is with every trip it just gets better and better. More asking questions by the staff, more learning, more training and more services provided to their community. When we leave, the clinic staff is able to provide a level of care that is higher than before we arrived. That’s the goal. But ahh…the elusive finish line. When are we truly “finished” and go into maintenance mode? Because the bigger picture would be to take this concept to more clinics in order to broaden the reach. For now, we have our work cut out for us with these two clinics and we still have so much to learn. But I’m more energized than ever that we are on to something. A chronic disease management program as well as specialty services and training to address more urgent needs of the community. So much to do! So, our next trip is potentially planned for the last week of January and the first week of February. We are contemplating taking a cardiologist and/or dermatologist with us next time. And of course will continue with chronic disease and optometry. So, until then, thank you so much for reading and supporting this important initiative. We will continue to post on Instagramand Facebook as we have so many pictures and it would be a shame not to share them! The whole team (minus Dr. James). Dr. Michael having an early run with the house dog Lucy. Our fifth day at Fluorspar and our last full day. We’re headed to the only outreach we’ll do on this particular trip. We will be going to a new location for us and for the Fluorspar clinic staff. It’s up high in the mountains about a 30-minute drive from the clinic. We arrive to a group of young children and their teacher. The location of the outreach is in a church. The outreach will be held inside of the community church that also serves as the nursery school. The teacher gave us a tour of the outside area around the church. First we see 2 pots boiling over a wood fire. The teacher of the nursery school explains the cooking pots. One for rice and the other for beans. One pot was full of water that will be used to cook rice. The other was full of boiling water and red beans. Combining the beans and rice is a typical dish here. I’m wondering why there is no maize in the pot in order to make their traditional dish, githeri. I think I may have my answer when I am shown the storage area for keeping the maize and I see that it is empty. Storage space for maize. The structure is made of mud. It comes to my mind the lack of rains in August and that the price of food increases in the dry season, even more so when the rainy season never came. For this population the meal will now consist only of beans and rice with no maize or greens. Although they may not go hungry they are lacking the important nutrients that improve their immune systems and overall health. The Fluorspar staff begin to setup for Dr. Michael and Rahema who will see children and adults and Dr. Sue who will conduct cervical cancer screening clinic alongside Samuel. We will divide and conquer today with Dr. Sidiqa and Alex visiting the Fluorspar school doing vision screening and nutritional assessments and education. Faith, the community health worker who we met earlier in the week, is here doing chronic disease screening. All of the adults are given a sheet of paper with their blood pressure, age, whether they are diabetic, a smoker or drink alcohol. We are thrilled to have her here screening patients and collecting data which continues to be compiled back on the computer at the clinic. During this process, we were presented with a man complaining about a ulcer on the bottom of his foot. Despite the fact he’s able to walk he is not able to feel his legs from the knee and below. He is presenting as an end-stage diabetic who will likely need to have his foot amputated at some point. He’s been instructed to go to the Fluorspar clinic to have a proper diagnosis and receive medication. He will be educated on managing his diabetes both with medication and nutritional strategies. We give him antibiotic to treat the foot and advise him that his infected foot is likely due to diabetes and that it’s essential that he comes to the clinic for treatment. He promises to come and we pray he does to minimize any further preventable damage. One of the most heart-wrenching moments was when a son arrived carrying his father. The father suffered the effects of leprosy from years ago. His foot had been amputated and was replaced with a wood peg. And his toes on his other foot were also removed. Although the leprosy had stabilized, he was now suspected of having tuberculosis. He will need to come to the clinic to have a confirming diagnosis and begin his treatment. His son assures us that he will get him there. The sight of him scooping up his father (who was arguably larger than the son), thanking us with such gratitude and then leaving with his father in his arms will simply never leave me. Some of Dr. Michael's patients. Dr. Michael also saw 2 young girls, who are pictured above. The one on the left is 9 years (in yellow) and the one on the right is 5 years old (standing). After taking a history and conducting a clinical examination Dr. Michael is suspecting syphillus. Her father will bring her into the clinic to be tested and begin treatment. Although it will not fix the damage that has been already done she will now begin to develop at a more normal rate. Outside of the clinic in the church, you never know what you will find around the corner ... like the obstacles I encountered on the way to the outhouse. On my way to the outhouse, the white building. Needed to literally excuse myself around the chicken and the cow as they had no intention of moving. We also notice several skin conditions today. Our plan is to bring a dermatologist with us on the next trip. The clinic claims that skin diseases are the second most common ailment, just behind upper respiratory tract infections. We see a myriad of conditions today and I am making a list and taking photos so that I can share with our dermatologists. 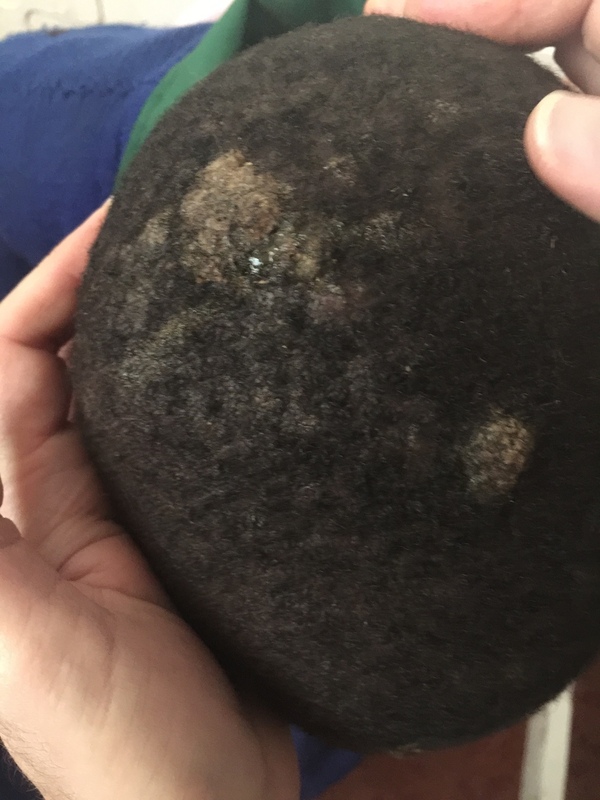 Eastern Africa has many skin conditions specific to its region and we want to make sure the dermatologist will be familiar with the unique issues. Cases included one that had begun to scab and showed signs of squamous cell carcinoma; one child had symptoms of ringworm; and a young girl had an advanced-stage fungal infection on her head. The conditions are not easy to look at and are not what we are used to seeing back home. But these are the very real issues that many rural communities in Africa deal with every day. It is our goal to provide education to the staff so that they are better prepared to care for their community. Alex had an opportunity to speak to the children at Fluorspar primary school. She gave them a nutritional talk and answered all of their questions. She also had a chance to speak with the chef who prepares the food for the students many of whom are boarders. The menu includes very typical dishes of the area including githeri, ugali and a treat on Sunday mornings, mandazi. We notice that vegetables are listed every day which is not common in the public school system. Fluorspar does a far better job than most of the schools with a more balanced and healthy diet. Still, Alex will be making some recommendations to make it even better. Likely her first suggestion will be to cut down on sugar. The traditional tea that is served has a lot of sugar in it. It’s absolutely delicious! Having tea is one of my favourite parts of being in Kenya. But my team reminds me that having 2 or 3 cups of it likely puts me over my daily allowance of sugar. There is that much sugar in it! So the recommendation will be to reduce the sugar and to reset the taste buds. Apparently it takes 3 weeks to readjust our palettes so that we are satisfied with less sugar or salt, etc. So this will be first on our list. Perhaps it will be easier to suggest taking something away vs adding to the overall cost of the food program. Dr. Sidiqa began vision screening at the schools. She was working with Jemimah and Noah on how to do the screening properly so that they will continue when she is gone. The goal will be to screen all of the children by the time we return by February and then move on to other schools in the community. Any children requiring glasses will come to the clinic to be examined by the auto-refractor and prescribed and provided glasses. We all headed back to the guest house to prepare for dinner as we were having the clinic staff over for a little party. We had so much fun speaking with them on a more personal level, learning about their families, their culture, and, of course, their music! I’ve already downloaded three albums which are amazing. It’s a little part of Kenya that I can carry with me wherever I go and think back to this amazing group of people who care so much for their community. Tomorrow is our last day. Hard to believe it has finally come! Check back tomorrow for the last post! After a quick flight, we have arrived at Fluorspar, our other sister clinic in Kenya. Rahema, a clinical officer at the clinic, during our first day of rounds. Yesterday we arrived at the clinic to a warm welcome from the staff. It was so good to see them again and hear all that has been happening in their community. We quickly reviewed the itinerary for the week and Alex gave an overview of nutrition and how she planned to support the doctors throughout the next few days. We then immediately saw patients for the next hour that provided excellent teaching points for the clinicians. Nothing like getting right back in there and wasting no time. The Fluorspar clinic team presenting a case to Naweza doctors. So today we began with rounds as always at Fluorspar. Different from Lewa, Fluorspar is an in-patient clinic and always seems to have patients who have stayed the night. Since yesterday, we’ve seen several patients including type 1 and 2 diabetics, a pregnant woman with abdominal cramps, a woman who just delivered a healthy baby as well as a 9-day old baby with neo-natal sepsis. Neo-natal sepsis is a life threatening infection in a baby occurring within the first month of life. This baby is 9 days old and suffering from neo-natal sepsis. Dr. Michael is providing training on prevention, diagnosis and treatment for this life threatening condition. The mother was holding vigil over her baby when we came in and seemed to be intently listening to everything Dr. Michael was saying in hopes that he could help. Although the baby seems to be improving with the intravenous antibiotic, there’s a risk of delayed development, seizure disorder and hearing loss. Dr. Sidiqa, Jemimah and Noah discussing how the cataract surgeries will work tomorrow. It was also an opportunity to review how the weekly vision clinic is going. The optometry team had a debrief yesterday in anticipation for the cataract surgeries scheduled for today and tomorrow. We’ve sponsored 2 surgeons and 2 assistants to do the screening and the actual cataract surgeries. Last week they screened 327 people and found 50 who are eligible for the procedure. Today they did 30 surgeries and tomorrow another 20. It’s the first time cataract surgeries have been done at Fluorspar and the staff seems very excited. Cataract surgeries being conducted at the Fluorspar Clinic. They will perform 40 surgeries in 2 days. I had the opportunity to observe an actual surgery today. Really incredible. And remarkable they are able to do this here. The surgeons are working side by side while the assistants are prepping the patients in an adjacent room. They are extremely professional and super cool under pressure. The staff at the clinic are assisting with the surgeries which is an amazing opportunity for them. They will also learn about post-op follow-up which is crucial to the success of the surgery. The cataract patients lined up waiting to be prepped for the procedure. Dr. Sue is working with Samuel and Rahema doing cervical cancer screening. They’ve seen 21 women and luckily all had normal results. Usually you would expect to see about 10% of abnormalities but this group is luckily healthy. Two members of the Fluorspar staff prepare supplies for the cervical cancer screening. It actually proved to be a good opportunity to discuss how certain “normals” can look abnormal and knowing how to distinguish between the two so that you don’t treat the lesion unnecessarily. Alex had an opportunity to speak with several patients about their diets and give her recommendations. 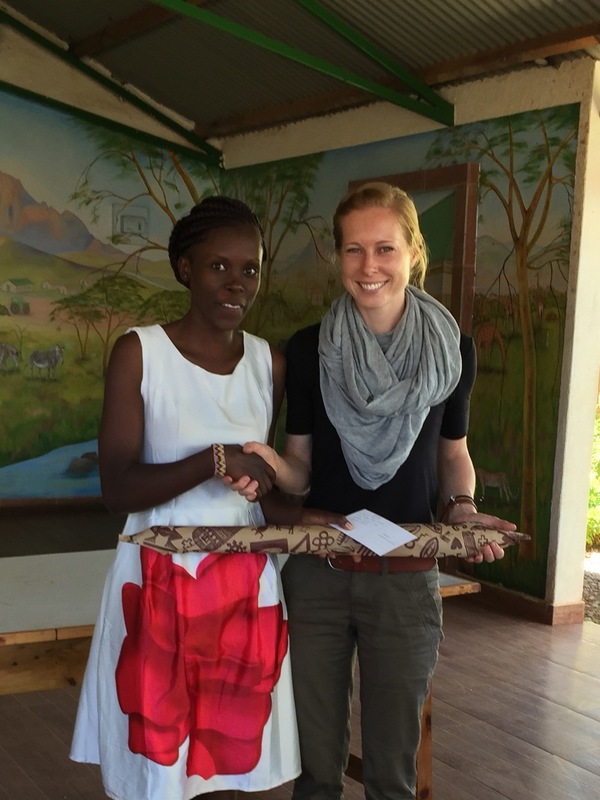 She also met with the chef of the clinic to better understand the food that is served at the clinic. She asked what his recipes were but he said that he doesn’t follow any. So she has decided to work alongside him tomorrow so that she can see how and what he prepares. Helen and Faith, two of the three community health workers we've hired at Fluorspar Clinic in order to support the chronic disease program. e also had the opportunity to meet with 2 of the 3 community health workers we’ve hired for the chronic disease program. Helen was the original hire who did an incredible job organizing a strategy on how to collect data on all of the people in her community who are over 40. She has almost collected data on 450 people, which represents about 90% of her community. Helen's notes on who to follow up with for the chronic disease program. Helen's work went way beyond our expectations. So we’ve decided to continue the relationship and she will now train all of the new health workers. We’ve already had her train Faith who has collected data on about 200 people. And we just hired a male health worker named Alan. Helen will train him as well. Helen and Faith share their record books on their chronic disease patients with Dr. James and Dr. Michael. The cost of a health worker is about 10,000 ksh/month or about $100 USD. If you get a good one, like Helen, they are worth their weight in gold. Her next step after she has collected the data is to follow-up with all of the patients who scored non-green. The ultimate goal is to find those people at risk of chronic disease and provide the treatment to them before a cardiac event occurs. Again, these are patients who are asymptomatic and have no idea they are at an elevated risk. It was a highly productive first day and tomorrow will be much of the same with more cataract surgeries and cervical cancer screening. The patients who had their surgeries today are actually sleeping at the clinic to be checked first thing in the morning. It will be very exciting taking their patches off tomorrow and seeing their reactions when they are hopefully able to see again! That’s all for now….thanks for reading! It’s our last day at Lewa and we must say our goodbyes. It’s been a highly productive week with the team. We’ve made strides in our chronic disease program by providing education on various disease topics as well as hiring our community health worker who began collecting data on patients. The clinic now has skills in running cervical cancer outreaches and more knowledge on women’s health. We’ve begun the optometry program whereby the clinical officers will begin a weekly eye clinic and provide eyeglasses to their community. And we introduced the concept that nutrition is medicine and demonstrated how it can support the chronic disease program. During our last moments in the open meeting space, the same area we’d used all week for teaching, the Lewa team said lovely things to us in their final remarks. We of course responded with our own words of gratitude for welcoming us into their clinic and for being so receptive to the program we’d put together. It was a joint effort to achieve what we had in the last 4 days and it was important that they knew we appreciated their commitment to making the week a meaningful one. But now it was time to say goodbye. So each member of the Naweza team was asked to go up one by one to receive a personal note and gift from their partner that they’d worked with during the week. Thanks again for reading. If you like what you read, please share with a friend or colleague.